We are one of the largest fuel suppliers in Tallahassee and north Florida. We specialize in fleet fueling, off and on road diesel, fuel card lots, lubricants and oil and greases. 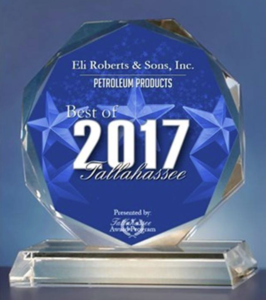 ELI Roberts Oil Company is dedicated to providing the highest quality products and services available. We are a 3 generation family business with over 50 years of service to our community. Our fleet fueling services are second to none and as a major petroleum distributor we are ready for the energy needs of our region, now and into the future. If you are in need of Fleet fueling services, we are the company to do business with. We have 365/7/24 service with a staff to see to any needs. We have two conveniently located, fully automated 24/7 locations using “Fuelmaster” card fueling systems. Emergency services and generator fuel for large and small businesses, medical facilities and hospitals are also a specialty. We are proud suppliers of Sunoco, Marathon and Pure brand fuels and oil products and are North Florida’s premium petroleum distributor and wholesaler. Give ELI Roberts & Sons a chance to earn your business and “we guarantee” you’ll be glad you did. We serve customers throughout the Southeast United States and can give turn-key service 365/7/24. As a petroleum distributor we have major fuel partners and are proud to carry “Sunoco Fuels”. Whether Diesel Fuel, Standard Gas, No Ethanol Marine Gas, Racing Fuel, Lubricants or DEF, ELI Roberts Oil Company is there to serve. Since 1958 we have been a family owned and operated company. Mr. Eli Senior started with a gas station on Tennessee Street in Tallahassee, FL and served the community for many years. Son and Grandson are now part of the team taking ELI Roberts Oil Company into the future on a stable foundation. Dedicated to the long haul, we are there 365 days a year, 7 days a week, 24 hours a day. We are dedicated to providing fuel services to your business. Emergency storm services are a specialty of ours. With tanker pumping stations and a team of dedicated specialists we are ready for refueling emergency vehicles for first responders. Our expert staff is customer service oriented with a focus on customer’s needs. We have a 50 year history of very satisfied customers and have formed some great relationships during this time. Give us a chance to be your fuel supplier and you will be glad you did. ELI Roberts & Sons wet hosing solution is perfect for us… on-site fueling keeps down time to a minimum. They can transport fuel to our yard and refuel our equipment withe economy and efficiency. Our construction company needs to be up and running. When our equipment on-site needs fueling operations, we turn to Eli Roberts & Sons they are on task and get the job done. Our school buses must be fueled and ready every day all year long. Eli Roberts & Sons fleet fueling keeps the buses rolling.